Subject: NOTIFICATION OF YOUR OUTSTANDING PAYMENT !!! I am Ms. Carman L. Lapointe, Head Of United Nations Under-Secretary-General for Internal Oversight Services. You will get more information about me here. This is regarding your long over-due fund which you have been having difficulties trying to receive. Your payment has been finally approved by this office. This is part of an instruction/mandate by the United Nations in conjunction with the International Monetary Fund in respect to overseas contract payment, re-scheduling and outstanding compensation payment. Your fund is valued at Eight Hundred and Fifty Thousand United States Dollars only and will be transferred to your preferred bank account. You are advised to kindly get back to me with the below details. Thanks for your co-operation as I wait to hear from you. Note: As soon as your details have been received here, you are to stop any further communications with all other bodies to avoid mis-appropriation of your funds. Subject: RE: NOTIFICATION OF YOUR OUTSTANDING PAYMENT !!! 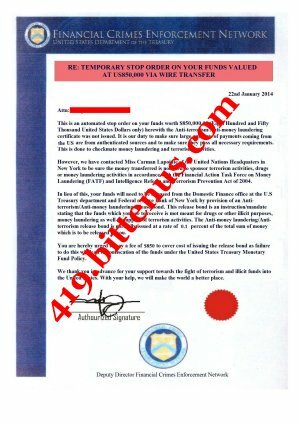 I am writing with regards to your outstanding funds of $850,000 herewith the approval order certificate has been issued to you and is attached here for your perusal. You can take time to go through it. You are hereby requested to provide your bank information. This should be the bank account where you want your funds transferred to. Your funds will be transferred to your account via wire transfer as soon as you have provided your bank information and we have verified it. Please note that all personal as well as banking information are safe with us and will be treated with the strictest confidence. Moreso to answer your question, I will personally encourage you to keep this from your husband until the funds are safely lodged in your account. It will come as a pleasant surprise for your husband and your family at large, just imagine the smile on their faces. Keep this a secret from everyone for now. I await your email with bank details. Please do like I told you and keep this quiet for now, until the funds are safely lodged in your account. 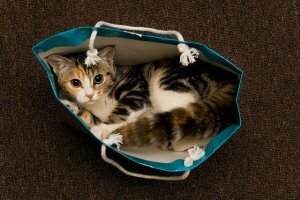 Then you and the family can go somewhere nice and quiet, and then you let the cat out of the bag. I have received your bank details. We will verify these details with your bank on Monday morning and commence transfer at about 11 am. I will keep you up to speed on everything. Your family is safe. You and your family are very safe. You have nothing to worry about. We can protect your family. So, just relax. Your family is safe. Okay? You are very much welcome. I will help you receive this money. It is my job to do that. Be rest assured that everything will work out fine. I will keep you updated on Monday when transfer is to commence. Subject: Wire Transfer notification !!! 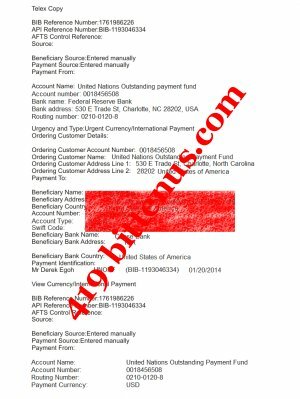 Sequel to instructions from the United Nations Headquarters in New York to credit your bank account with the sum of US$850,000 (Eight Hundred and Fifty Thousand United States Dollars only), I am glad to inform you that the said funds have been successfully wired into your bank account. Below is your bank account details where the $850,000 was transferred to. Please note that time of reflection of funds into your above stated bank account is calculated as two (2) business days in accordance with standard banking policies. I am waiting on the transfer slip to be faxed to me from our bank. As soon as I receive it, I will forward a copy of the slip to you for your perusal. So, you can expect your funds in your account on Wednesday. Subject: RE: Wire Transfer notification !!! Attached here are copies of the transfer slip. By Wednesday, the funds should be in your account. Well, just wait till Wednesday after you have received confirmation from the bank before you tell your husband. Okay. Tell me by Wednesday if you have received the funds in your account. Hope the family are all doing okay. I have been notified of the reason the funds is yet to be in your bank account. We received a notification from our bank about a temporary hold on the $850,000 fund transferred to your account. This was from the Bureau of Counter-terrorism department of the US Department of States. It is stated that you will have to secure an anti-terrorism/anti-money laundering certificate from the department before the hold on the funds can be lifted and it will be allowed to be credited into your account. This is to checkmate money laundering and terrorism activities. This certificate will declare your funds clean and drug-free. this is done for funds of this nature especially because of the amount involved. I have attached a copy of the stop document here for your perusal. This certificate is issued at the rate of 0.1% of the total amount of funds to be received. That will mean the certificate will cost you $850. As soon as you get this release bond, the $850,000 will be credited into your bank account. you do not need to call your bank. The funds will be credited to your sccount as soon as you have paid for the certificate and after that, you can then tell and celebrate with your husband and family. For now, you still have to keep it from them until you have the funds. the US are from authenticated sources and to make sure they pass all necessary requirements. This is done to checkmate money laundering and terrorism activities. Laundering (F ATF) and Intelligence Reform and Terrorism Prevention Act of 2004.
which is to be released to you. the United States. With your help, we will make the world a better place.